Pakistan’s Supreme Court acquitted on Wednesday morning Aasia Bibi, a Christian accused of blasphemy eight years ago. 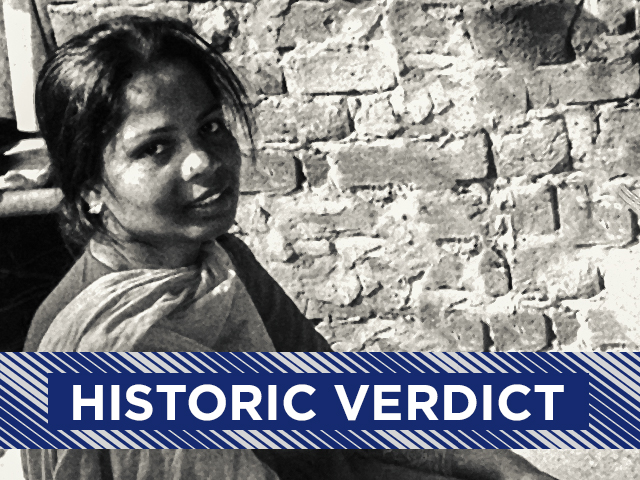 The trial court and Lahore High Court’s verdicts sentencing her to death have been overturned. The court has also ordered that she be freed immediately if she isn’t wanted in any other cases. The verdict on Aasia Bibi’s appeal challenging her death sentence was announced at 9:35am. The special bench hearing the appeal consists of Chief Justice Saqib Nisar, Justice Asif Saeed Khosa and Justice Mazhar Alam Khan Miankhel. The full verdict can be read here. “As noted above, no one could be allowed to defy the name of the Holy Prophet Muhammad (PBUH) and be left unpunished, but there is another aspect of the matter; sometimes, to fulfill nefarious designs the law is misused by individuals leveling false allegations of blasphemy,” read the court order. “Stately, since 1990, 62 people have been murdered as a result of blasphemy allegations, even before their trial could be conducted in accordance with law. Even prominent figures, who stressed the fact that the blasphemy laws have been misused by some individuals, met with serious repercussions. A latest example of misuse of this law was the murder of Mashal Khan, a student of Abdul Wali Khan University, Mardan, who in April 2017 was killed by a mob in the premises of the university merely due to an allegation that he posted blasphemous content online,” read the court order. “It is to be noted that Islam as stipulated in Holy Book Quran teaches us, amongst many other virtues, to live in peace and harmony, with compassion and love to our other fellow human beings. It is however to be kept in mind that unless proven guilty, through a fair trial, as provided for in the Constitution and the law, every person is considered innocent, irrespective of their creed, caste and colour,” read the 56-page order. The court added that there were many discrepancies and inconsistencies in the statements of the prosecution’s witnesses. Religious groups have called for a protest across Karachi after Asr prayers, which is between 4pm and 5pm. Reports of protests breaking out as of 9:41am outside the Punjab Assembly after the verdict was announced. Workers of a right-wing political party began gathering outside the assembly. Islamabad’s hospitals have been put on high alert and the leaves of all paramedical staff have been cancelled. The metro bus service has been suspended in Lahore. Several schools have announced early closure and are sending children home. Traffic on Islamabad motorway has been clogged since 2pm. Owing to prevalent law and order situation, everyone is advised to please restrict their movement for the next few hours, said the Islamabad deputy commissioner. Faizabad, Aabpara, Barakahu and the Kashmir Highway are blocked by protesters, he said, adding that they have arranged for alternate routes that will be shared soon. At 9:50am reports of minor unrest emerged from Karachi’s Numaish. 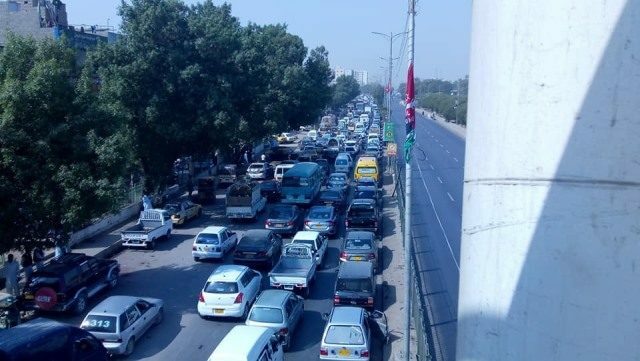 Traffic on the EBM Causeway in Karachi’s Korangi has also been suspended after protests at Brook’s Chowrangi. Traffic at Teen Talwar in Karachi’s Clifton has also been blocked. Traffic at Merewether Tower in Karachi has been blocked, as have roads in Baldia Town. The protest in Baldia is being led by MPA Qasim Fakhri. Protesters have begun burning tyres at Tower. Traffic has been blocked on the ICI Bridge in Karachi because of the protest at Tower. The road has been blocked at Tower in Karachi. In Lahore, the right-wing party’s leadership gathered on Mall Road and started protesting. Traffic is blocked at Azaadi Chowk as well as near Data Darbar and Mall Road. Daroghawala Chowk is also blocked and a severe traffic jam is being reported on Ferozepur Road. 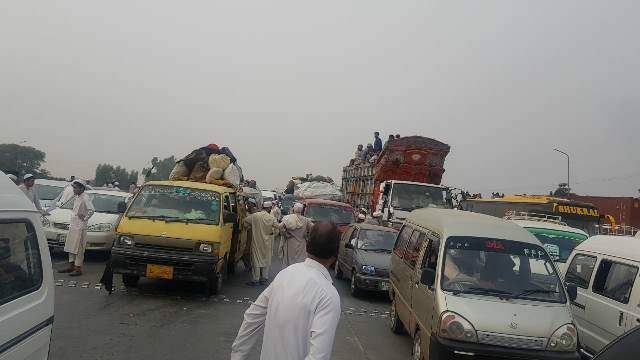 Traffic from Islamabad to Lahore has been diverted from the Khanqah Dogran Interchange due to a blockade at the Sheikhupura and Kot Abdul Malik interchanges. Tyres are being burnt at the protest at the Faizabad Interchange. The Islamabad motorway to Lahore has been blocked for traffic. The vehicles have been stuck since 2pm. Workers of the party began gathering at 9:50am at Orangi Town’s Ghaus-e-Azam Mosque in Karachi and Native Jetty Bridge at 9:55am. Islamabad’s Aabpara Chowk has been closed. The Northern Bypass has also been blocked. A protest has begun outside the Sukkur Press Club against the Supreme Court verdict. Both sides of the road outside the club were blocked. The police are on high alert at entry and exit points to the city. Protests have also sprung up at Farooq Azam Chowk in Charsadda. The police are on standby in the city. 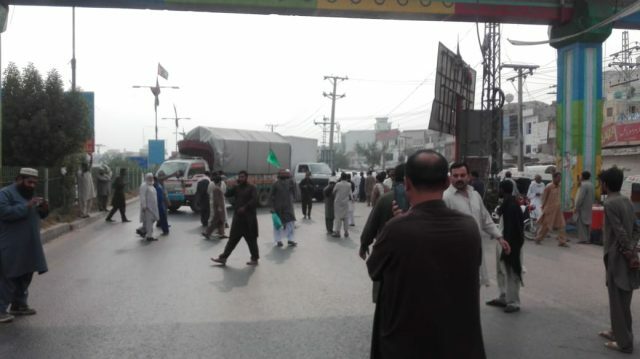 Protests also sprang up in Swat’s Tando Dag and GT Road was blocked. Protesters set up roadblocks in Karachi’s Baldia Town. People have begun gathering in Islamabad’s Faizabad as well. 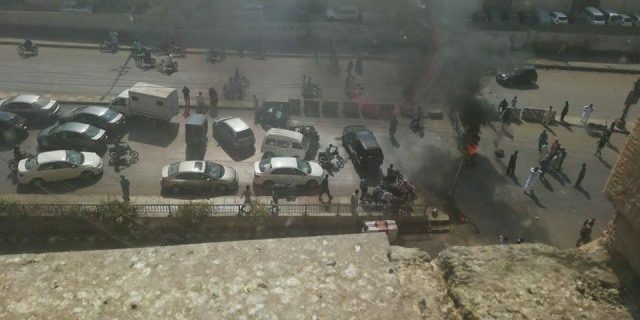 Roads in Karachi’s Saddar area were also blocked with motorcycles as protesters gathered at 9:50am. Protesters also began gathering at Jamil Chowk on Ring Road in Peshawar. Reports of protesters on the Motorway and on Sheikhupura’s GT Road also poured in. Protesters gather in Karachi’s Sohrab Goth. Protests also began on the Super Highway at Karachi’s Sohrab Goth. Traffic to and from Hyderabad has been blocked as of 10:30am. A severe traffic jam has been reported at PP Chowrangi near Guru Mandir. Korangi 1 and 2 have also been blocked for traffic. 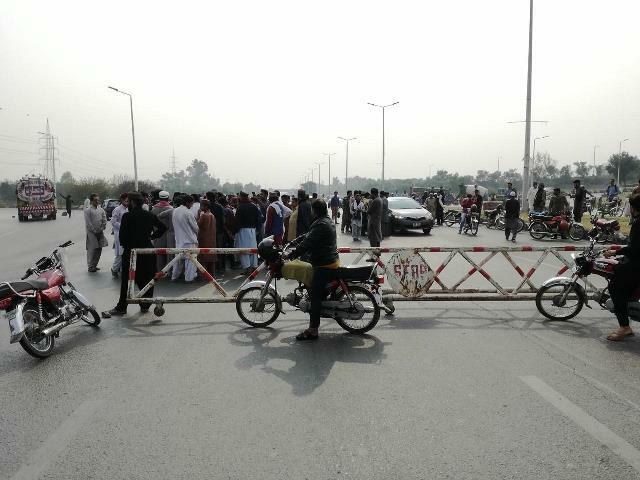 In Khanewal, protests broke out at Lahore Morr and traffic was blocked. In Islamabad, the Abapara and Faizabad roads have been blocked due to protests. The Faizabad-Islamabad Expressway has been blocked. The Faizabad-Islamabad Expressway has been blocked. 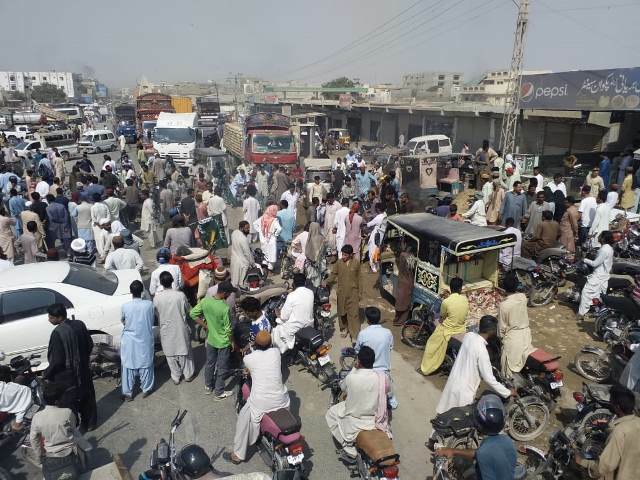 Shops in Sargodha were forcibly closed as protesters began protesting at 12 Block Chowk. Fatima Jinnah Road has also been blocked due to protests. Supporters of right wing political parties blocked both tracks of GT Road in Gujjar Khan, near Rawalpindi. Traffic is blocked at Star Gate in Karachi. 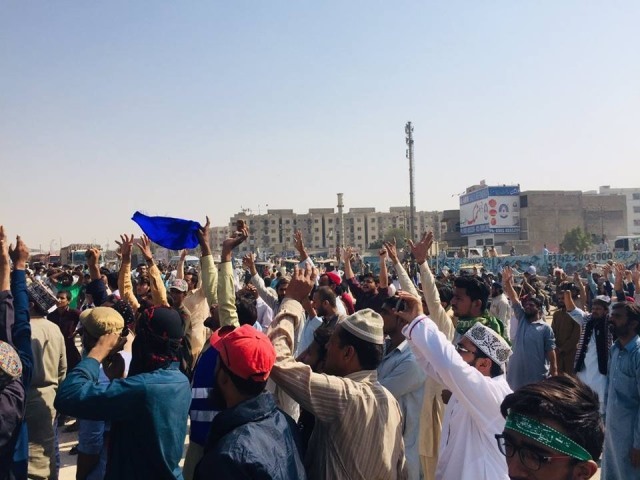 In New Karachi, protests also broke out. Sharae Faisal has been blocked at Star Gate. The Motorway has been blocked in Sheikhupura. The road has been blocked in front of the State Bank on II Chundrigar Road in Karachi. Protests have also broken out in Hub. 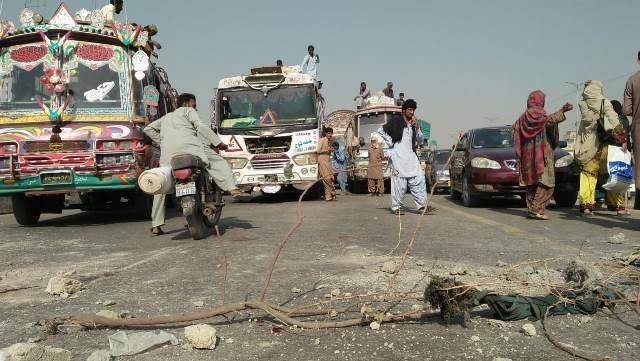 After protests broke out in Hub, the RCD connecting Sindh and Balochistan has been blocked. In Karachi and other cities across the country, roads have been blocked for traffic due to protests. In Karachi, the Lyari Expressway, roads between Karachi and Hyderabad, Sharae Faisal at Star Gate, Tower Road, Numaish Chowrangi, Hub River Road, Baldia No 4, Shershah Road, Super Highway and 4k Chowrangi. For traffic from Tower, a diversion has been created from Jinnah bridge towards MT Khan Road, MA Jinnah Road towards Baba-e-Urdu cut while II Chundrigar Road towards Uni Centre. Traffic from Numaish has been diverted towards 45 congress to PP Chowrangi. Traffic from Shershah has been diverted from Baldia to Labour Square and traffic from Mawach Goth is diverted towards 24 Market. Traffic on the Super Highway has been diverted to Al Asif Square towards Abul Hassan Isphahani Road. On October 8, a special three-member bench headed by Justice Nisar reserved its verdict after hearing the final appeal against the execution of Aasia Bibi. The appeal challenged a verdict of the Lahore High Court handed down in 2014 to uphold a trial court’s decision to sentence her to death. It was Aasia Bibi’s last chance to appeal her death sentence. If the court did not rule in her favour, her only chance was to appeal to the president for clemency. The court had said that the media cannot discuss or comment on the matter until its final judgement is issued. A case was filed against Aasia by a prayer leader in the village of Katanwala in Nankana Sahib. The prayer leader said Aasia had confessed to committing blasphemy during an argument with a Muslim woman over a bowl of water. The allegations are that Asia made comments during an argument with three Muslim women while they were working in a field in Sheikhupura. She was asked to get some water but the other women said she was unfit to touch the water bowl as she was Christian. The women later went to the prayer leader to complain. She was convicted and sentenced to death in 2010 and has been in jail ever since. A right wing political party issued calls to its supporters a day earlier to emerge at morning prayers. It asked them to head to the streets in case a protest is called. The administration in Sindh has, for one, issued a security alert to law enforcement. Police presence was increased at entry and exit points in Islamabad. Entry routes to the Red Zone were blocked with containers. The police is prepared to seal the Red Zone at a moment’s notice. Security at the Supreme Court was also put on high alert, with a heavy presence of Rangers and police both within and outside the Supreme Court. 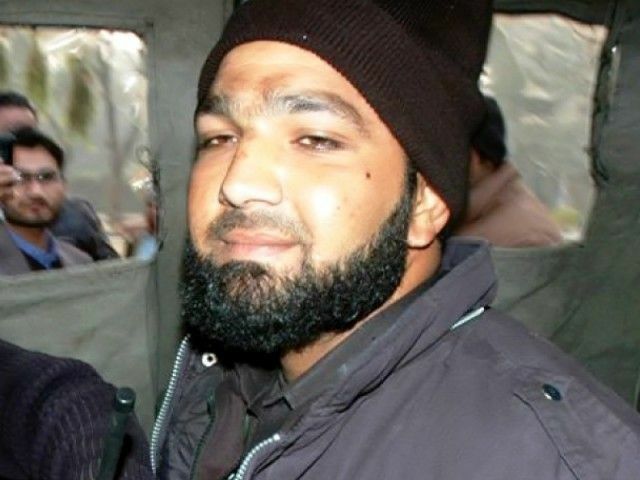 This case is linked to that of Salmaan Taseer, the governor of Punjab, who was killed by his bodyguard Mumtaz Qadri. The assassination took place on January 4, 2011 in Islamabad. 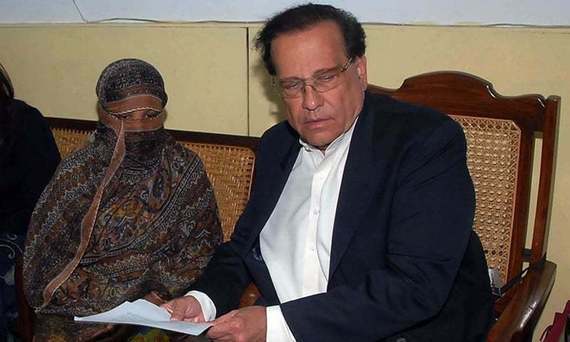 Salmaan Taseer had visited Aasia Bibi in a jail in Lahore and had received her petition for mercy. He had called for the blasphemy law to be amended to prevent it being abused. The head of the right wing political party that has been following the case closely arrived at the Punjab Assembly before the verdict was announced. The Supreme Court Bar Association election is scheduled to take place today (October 31) and this is likely to have a bearing on the presence of the legal fraternity in and around the court premises. Maulana Fazlur Rehman, the head of the MMA and JUI-F, has expressed his reservation on the verdict and urged party workers to come out and protest.